KUWAIT, 18 March 2019: Abdulmohsen Abdulaziz Al Babtain Co. (AABC), the sole authorized dealer of Infiniti vehicles in the State of Kuwait, announces that two INFINITI models received recognition in the 2019 Vincentric Best Value in America™ awards: the 2019 INFINITI Q50 sport sedan was named a winner in the Luxury Mid-Size Sedan segment, and the 2019 INFINITI QX60 was a winner in the Luxury Large SUV/Crossover segment for the third consecutive year. Vincentric measures cost-of-ownership using eight different cost factors: depreciation, fees and taxes, financing, fuel, insurance, maintenance, opportunity cost and repairs. Using a statistical model, Vincentric identified the Best Value in America winners by measuring which vehicles had lower than expected ownership costs given their market segment and price. More than 3,000 vehicle configurations were evaluated using a range of annual mileage intervals and insurance profiles. One of INFINITI's best-selling models, the Q50 sports sedan delivers a rewarding driving experience with a variety of innovative powertrain options, including the VR-series 3.0-liter V6 twin-turbo engine, which was named to the prestigious Ward's 10 Best Engines list for two years in a row. The INFINITI Q50 also offers more advanced safety features than the competition, including world's first technologies such as Predictive Forward Collision Warning, Around View Monitor with Moving Object Detection and Backup Collision Intervention. 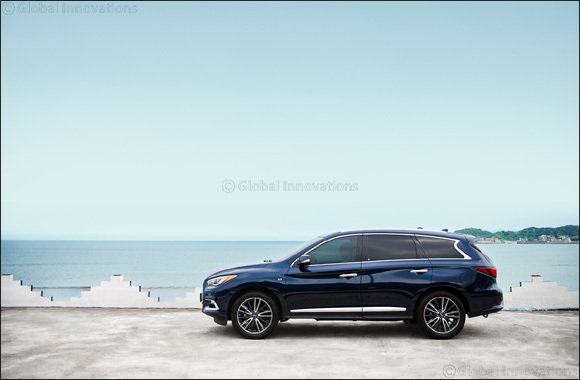 The popular and highly awarded INFINITI QX60 offers the best of both luxury and practicality with a combination of family-oriented features as well as a welcoming, carefully crafted design inside and out. With a third row of seating, the spacious interior adjusts to customers' needs. For the 2018 model year, the QX60 introduced a breakthrough technology designed especially for active families – Rear Door Alert. The new Rear Door Alert system, standard on all 2018 QX60 models, can help remind customers of things that may be forgotten in the rear seat, such as pets, valuables, dry cleaning, groceries and more. Other available driver assist technologies include: Around View Monitor with Moving Object Detection; Lane Departure Warning and Lane Departure Prevention; Backup Collision Intervention; Blind Spot Intervention; and Intelligent Cruise Control (Full-Speed Range). Also offered are the advanced Predictive Forward Collision Warning system and Forward Emergency Braking with pedestrian detection.